The Sisters Of Mercy hold a dear special place in my heart. I worked for the Sisters as the Nursing Director of their health care facility and fell in love with this order of Irish Women Religious. I listened to their stories of Catherine McAuley who founded the order in 1831 here in Dublin and their tales of visiting their “Irish Home” and all it meant to them. I knew that one day if I got to Ireland, my first stop would be on Lower Baggott Street where it all began. 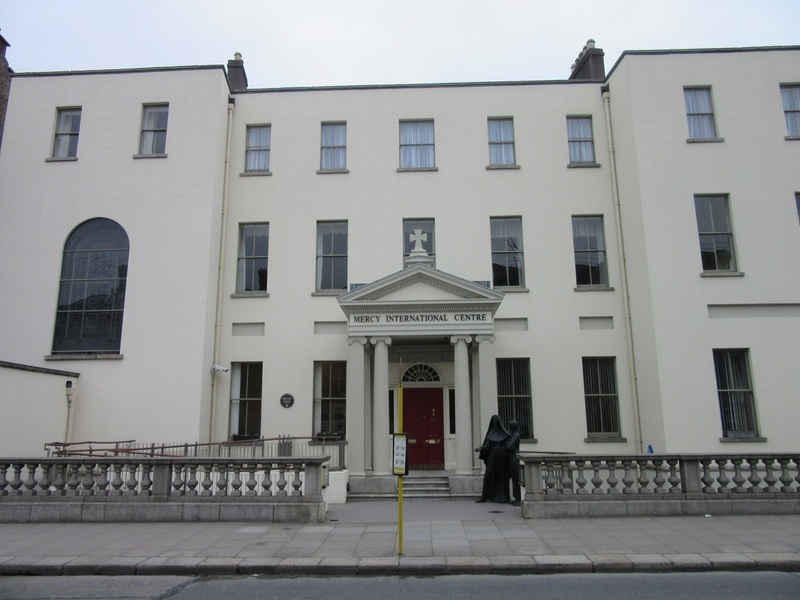 We landed in Dublin Tuesday morning and Tuesday afternoon I fulfilled my dream of visiting the site where the Sisters of Mercy began. This religious order is unique in that their Mission is to go out into the community and care for the poor, especially women, children, the sick and the dying, all very dear to my heart. Catherine McAuley was born in North Dublin in 1778, a troubling time in Ireland with enormous poverty and no assistance. Catherine was orphaned young after caring for her parents and then lived relative to relative until finally being adopted by a wealthy childless Dublin couple. Catherine cared for her adopted parents lovingly and became their sole inheritor when they died. 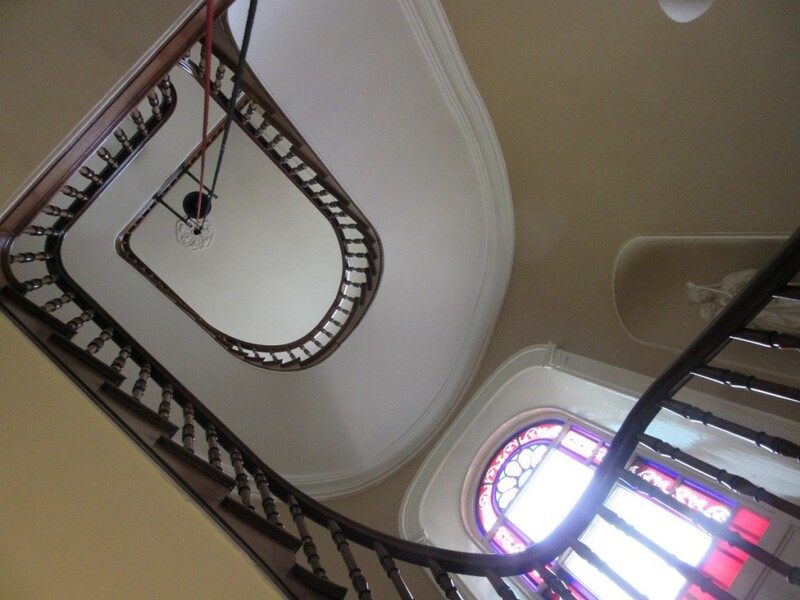 Instead of choosing to live comfortably, Catherine chose to use her inheritance to improve the lives in any small measure of Dublin’s desperately poor. 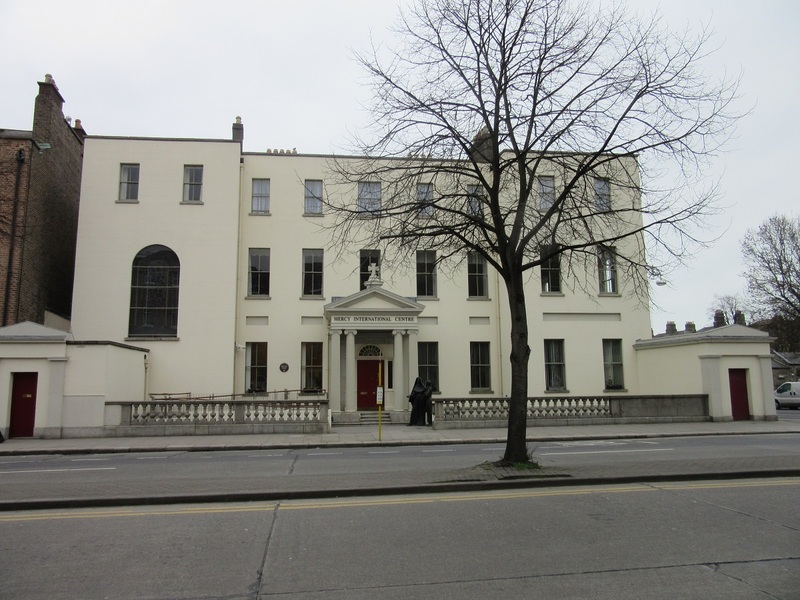 In 1831, at the age of 44, Catherine McAuley joined the Religious life and founded the Sisters of Mercy with the first house right there on Baggott Street. Today, the Sisters continue their works of serving the poor and under served all over the world. My beloved “Aunt Jo” has spent 70 years as a Sister of Mercy serving the most needy in Western New York. 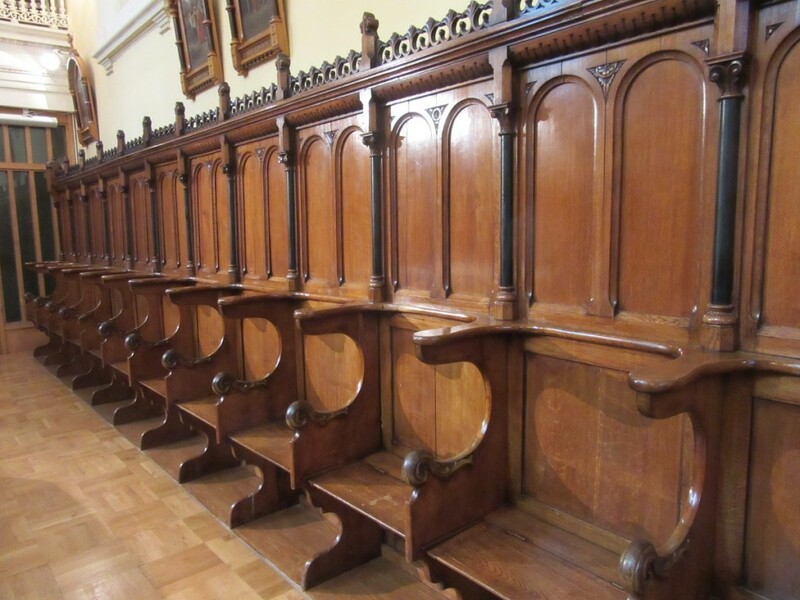 I had wanted to take the tour of the home of this religious order and enjoy, as Catherine said, ” A comforting cup of tea,” but our schedules would not allow it. I contacted Mercy International via email to see if I could at least visit the Chapel and their tiny gift shop. I did not receive a response. So Dan and I just got directions and headed over to Baggott St. Once there, no one was in sight and the door was locked. Well……I didn’t come all the way to Dublin just to chicken out and leave, so I knocked on the door. “Ask and ye shall receive.” A lovely woman about my age answered the door and after I explained my circumstances we were warmly welcomed and brought inside! And again, I experienced the care and love the Mercy Sisters are known for. 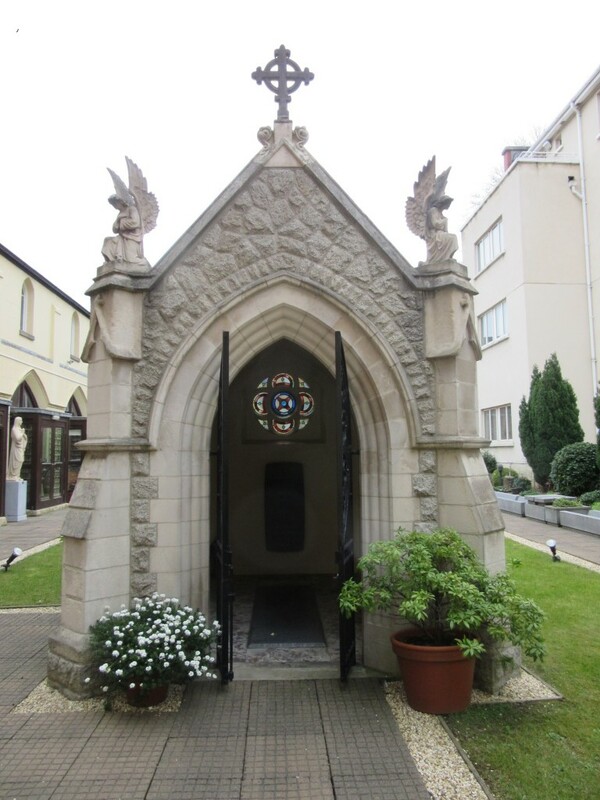 The Chapel was opened for us to see and we were guided to the serenity of the garden where Mother Catherine McAuley is entombed. And that is my simple story of following another dream and watching how it unfolded in front of me because of faith, hope and charity. The Sisters live simply so that others may live. 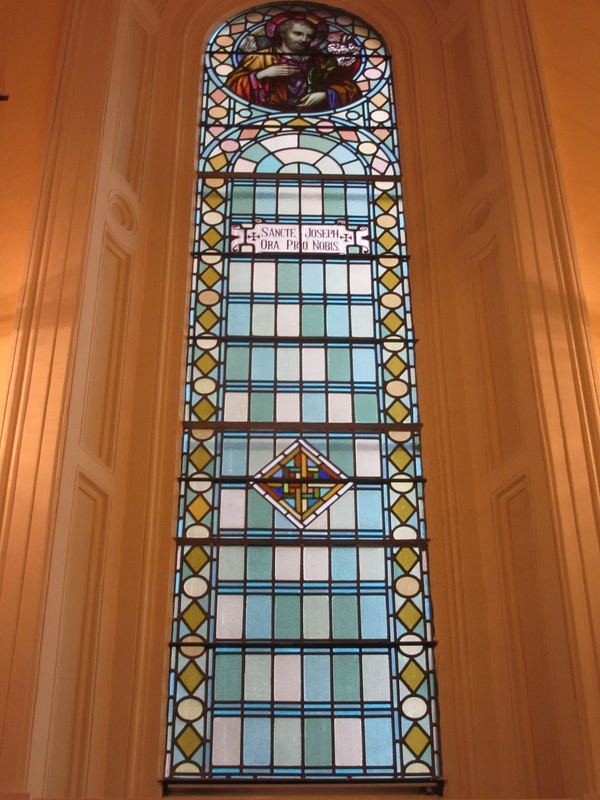 Stained glass window above the Tabernacle. St. Joseph for my beloved Sister Josepha. 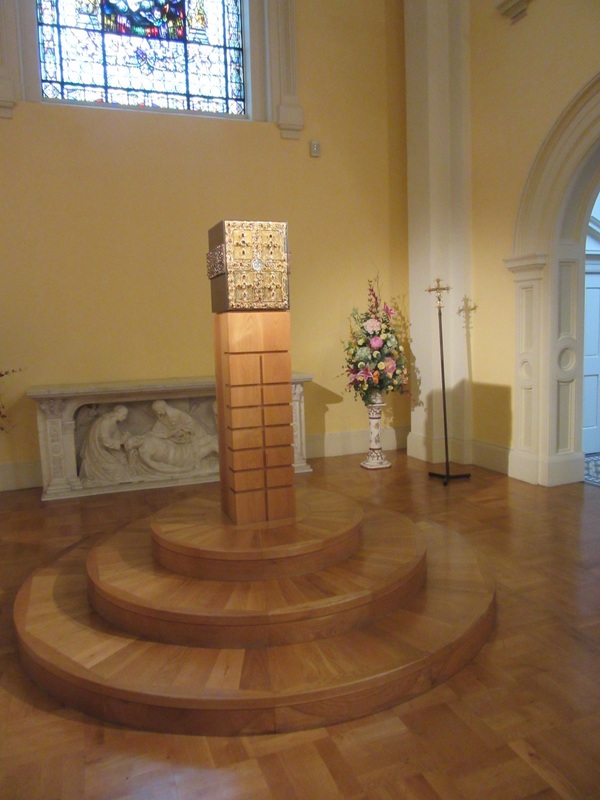 The Tabernacle is encrusted with gems from the dowry’s of the Sister when they entered religious life. 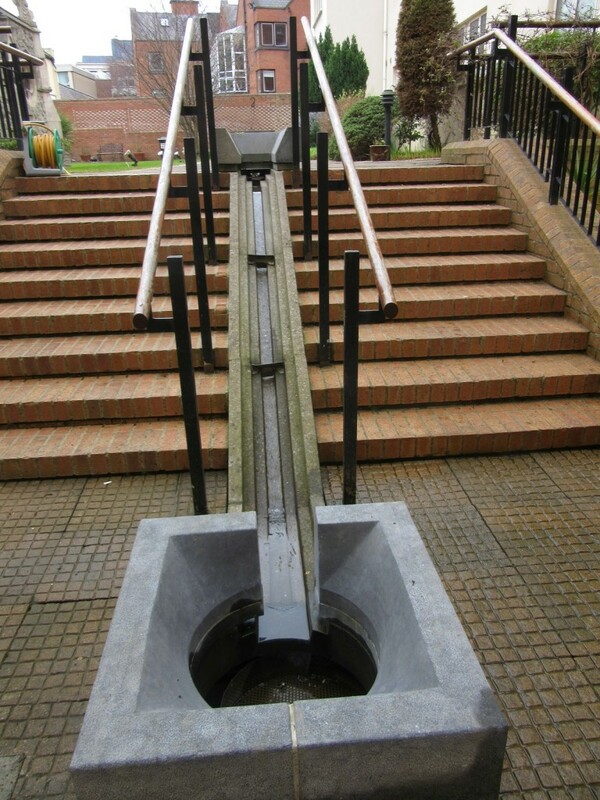 This lovely serene water feature adds an air of peacefulness. 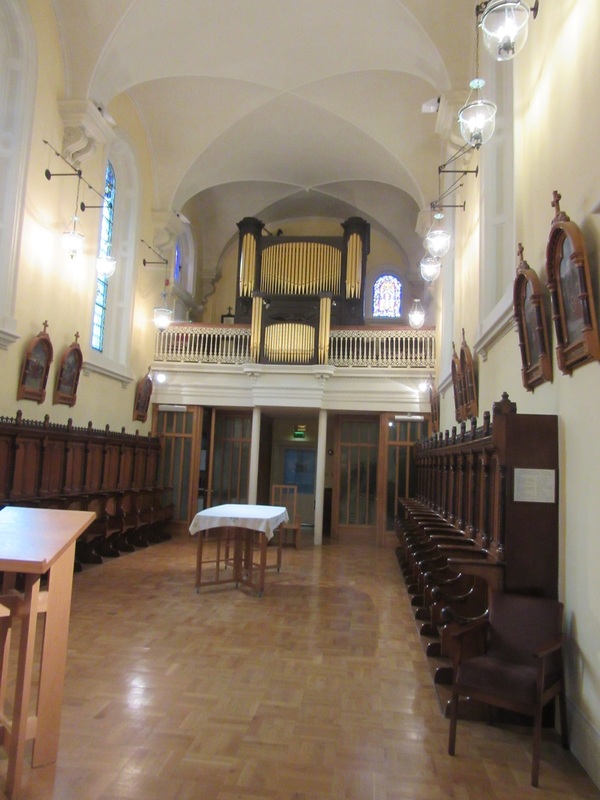 A sanctuary in the heart of Dublin. 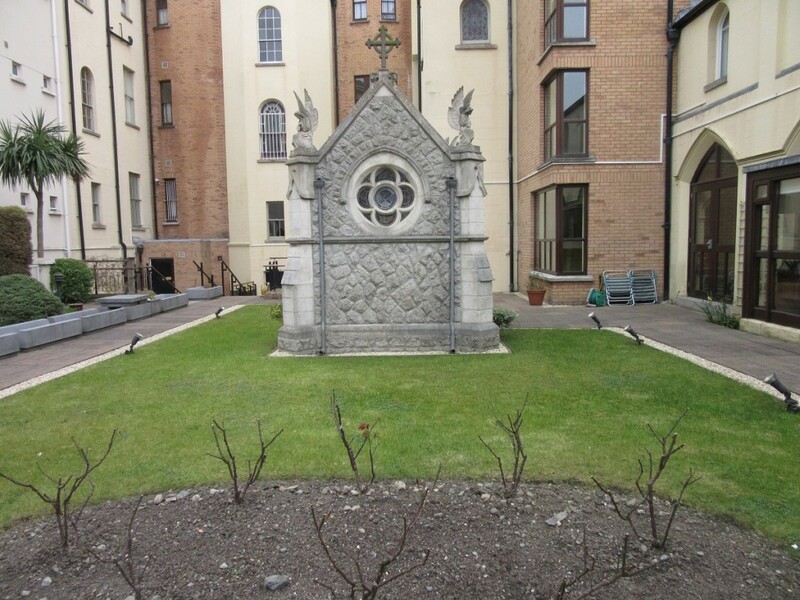 Mother Catherine McAuley’s tomb looking to the residence. 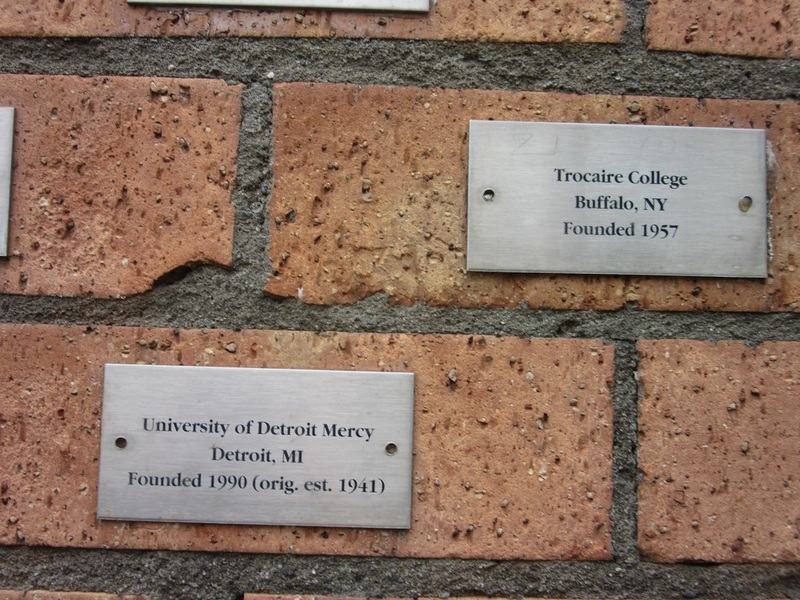 Mercy in action in Buffalo, NY and Detroit, MI! Crematories and Tombs normally would leave me sad and contemplative. Seeing the tomb of Catherine McAuley made me smile broadly and say “Thank you Catherine.” Your legacy lives on today and I am thrilled beyond measure to have witnessed the good works of Mercy. 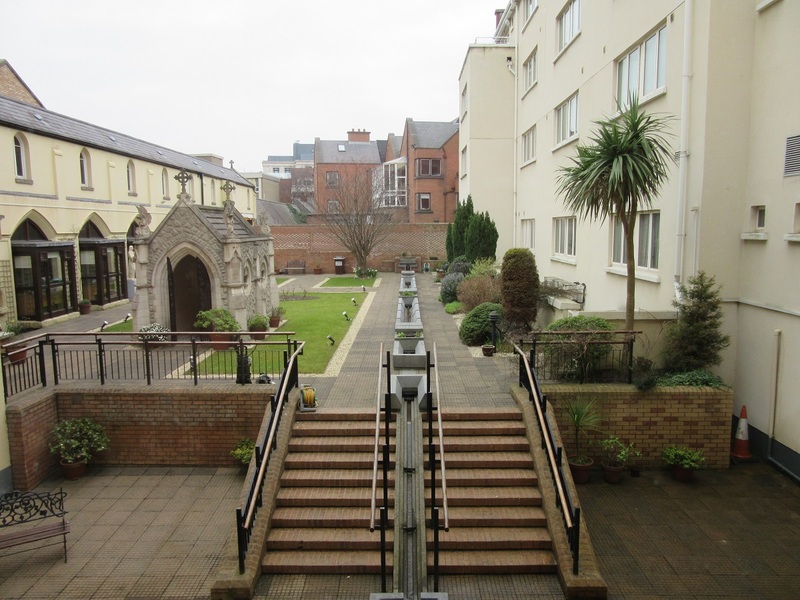 Thank you for sharing my journey to Lower Baggott St and the Sisters of Mercy. Wherever your journey leads you today, I hope you feel the presence of love. Nah……………..just counting my Blessings every day Pam. Thank you for sharing I felt as though I was there when I was reading your story and seeing the pictures . A wonderful piece with lovely photos. Thank you so much for sharing! This was beautiful Karen. 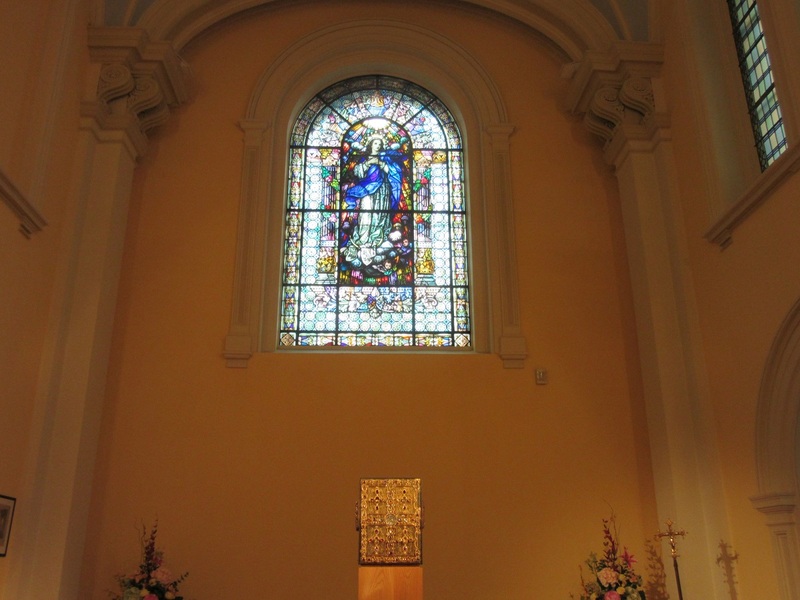 The stained glass, the organ, the choir chairs and Mother Catherine’s tomb just beautiful. All of it. 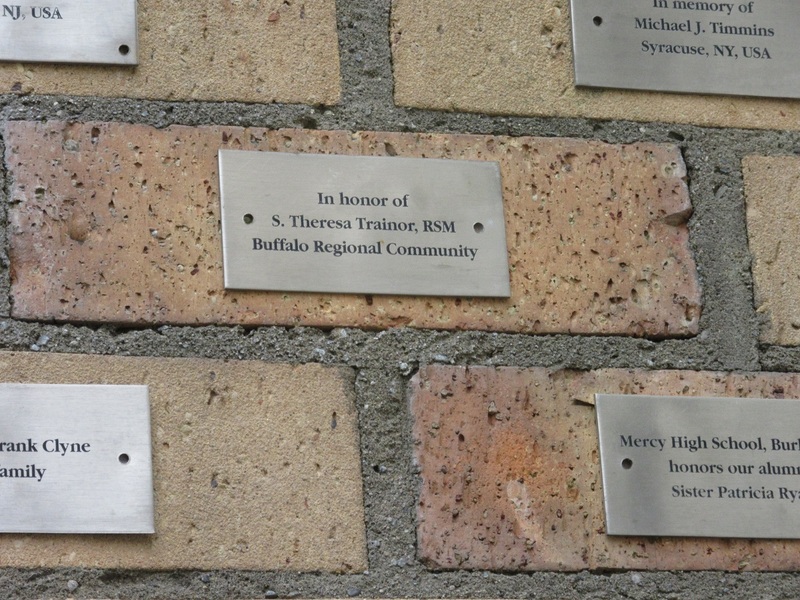 I was just so thrilled to be there and see where the Sisters Of Mercy all began! These little blue Nuns have my heart. So glad you enjoyed the post.